Riding instructor and equine therapist Kathie Smith, Osage City, talks to Cowboy, one of the horses at the Cross and Crown Farm. OSAGE CITY—At first glance, nothing seems out of the ordinary in the sandy riding arena of Osage City’s Cross and Crown Farm. However, hidden behind a mounting block is a collection of pompoms, marbles, jumbo flashcards and brightly colored toys. 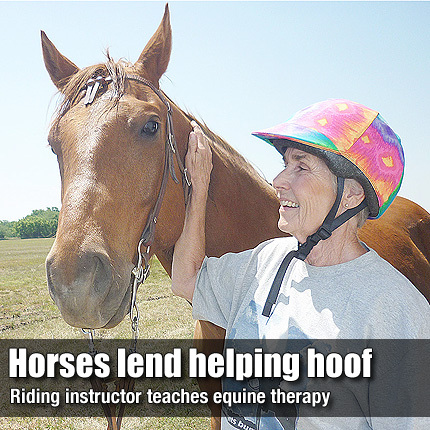 Owner Kathie Smith, 73, of Osage City, explained that as an equine therapist, she utilizes the objects during games and exercises that develop motor and mental skills in special needs riding students.